A mole is a collection of pigmented cells that generally presents itself as a small, brown-hued spot on the surface of your skin. It is possible for acne to form either under -- or on top of – moles, since moles are generally just a discoloration of your skin. However, an acne-type blemish that develops under a mole may actually be a sign of an atypical, potentially dangerous type of mole. Moles are extremely common. In fact, nearly every adult has at least one mole, according to the American Academy of Dermatology. In general, moles are completely harmless, but they can turn cancerous. 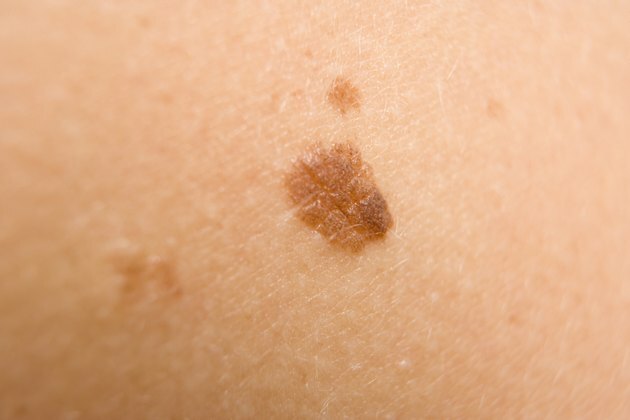 Skin cancer that develops in a mole is called melanoma. Atypical moles warrant a greater degree of concern and should be immediately examined by your doctor. Atypical moles include moles that include acne-like features. You should be suspicious of moles that contain acne-like symptoms. For example, a mole that grows larger, becomes inflamed or bleeds is considered atypical. Furthermore, a mole that discharges pus or other fluid – similar to a pimple – warrants concern. Moles that become raised or change to a red hue are also considered atypical. If your mole becomes bothersome in any way – painful, uncomfortable, itchy, swollen – consult your doctor as quickly as possible. As a general precaution, your moles should be examined by your doctor about once a year. However, if you develop a new mole or if an existing mole develops into an atypical mole, see your doctor immediately. Your doctor will most likely take a biopsy of your atypical mole. If the biopsy indicates that your mole is cancerous, treatment generally involves surgery to remove the melanoma. If the cancer has spread to your lymph nodes or other organs, you may require additional treatment such as chemotherapy or radiation. If your mole biopsy comes back negative and your doctor determines that your mole is benign, talk to your doctor about the possibility of acne forming under your mole. If your doctor determines that you do have acne under your mole – as opposed to an irritated or infected mole – seek treatment for your acne breakouts. Typical treatments for acne include over-the-counter topical ointments, lotions and cleansers. Depending on the severity of your acne, your doctor may prescribe a topical or oral medication to help combat the problem.